Well, it has begun. Teething. 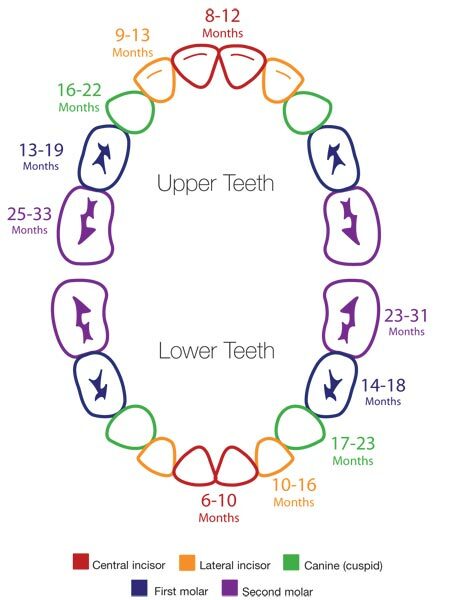 And by the looks of the infant teething chart above (provided by Orajel), looks like we’re in a for a few years of fun. True to the diagram, my son’s right central incisor is the first to erupt. Right now it looks like a pearly white dot in his mouth; at first glance it would be mistaken for a drop of milk or formula. But upon closer inspection, it’s clear that it’s the top of a tooth, peeking out amongst hills of red and swollen gums. Poor little guy is gumming onto anything — bibs, toys, his own hands — any chance he gets for some relief. DROOL: It’s coming in gallons. Soaking through several bibs a day. Dripping all over his clothes, the floors, and Mommy or Daddy when holding him. Turns out this is a classic sign of teething, especially if excessive and after 4 months of age. I read somewhere that the drool actually helps the baby with discomfort by cooling and lubricating the gums. Maybe so, maybe not… But it’s definitely everywhere. GUMMING: I don’t know the official term for it, but by this I mean grabbing anything and everything he can to shove it into his mouth for some chewing relief. His bib is usually an easy first grab, followed by his toys or even his own fists. He loves Sophie the Giraffe and is finally getting some use out of his teethers. Reduced Appetite: Feedings have become, at times, extraordinarily fussy. He tries to eat, realizes he is still in pain, cries/screams, tries some more, realizes it still hurts, cries some more, etc. Frustrating for all of us. I’ve found that alternating bottle and solids as part of the same feeding helps somewhat. I think it’s just because of the distraction aspect – something different to keep his mind off the pain. Whatever it takes. Kidsme Food Feeder: Baby and I both love this little contraption! It’s BPA free (yay) and holds little pieces of fruit or veggies for the baby to taste/eat without the risk of choking. I use it for teething relief by filling it with frozen mango chunks – the organic ones from Whole Foods are the perfect size. He gums it to his heart’s delight and gets to try new fruit while the cold takes the edge off. I also use it during flight takeoffs and descents; the sucking helps with his ears. Camilia Teething Drops: After complaining to my hubby’s cousin about trying to find a good teething relief agent that didn’t contain benzocaine, she recommended these drops. They are wonderful! A homeopathic remedy, they are single-dosage (read: sterile) drops that finally help provide relief for my little one. I’ve tasted them myself and they’re mildly sweet – not offensive like some other remedies. They guarantee both us and baby a period of calm whenever used. Also – since they are single dosages – they are easy to drop into your purse, baby bag, whatever. I get mine at Whole Foods although I know they’re available online as well. Other than that, we just provide a lot of love and comfort. Our son’s been a little trooper so far; a bit fussy and uncomfortable, but handling it overall. Would love to hear about other relief tips if any of you have them! Earlier this week, a friend of mine who is expecting her first child emailed me with a quick question about who our pediatrician is and whether or not we would recommend that person. Of course, being the long-winded person I am, I could not give her a simple answer – and ended up responding with all the pros, cons, and other tidbits I could think of regarding our experience with our particular pediatrician. Ask for Referrals. Duh. I didn’t even ask my OB-GYN. I should have. I did ask a couple friends, but their pediatricians were out of network for me, so I let it go there. I admit I ended up resorting to Yelp for my top candidates. “Scope Out” Referrals. Once I had a list of referrals from trusted sources, NOW would be the time for me to scope them out. Check their websites. Go to Health Grades and search for reviews. And yes, now would be the time to even go to Yelp. Check Scheduling. Sure, it seems trivial now, but when you’re a new mom wanting to take your baby in with issues… Or having to take your baby in as often as every month or two for vaccinations… You’re going to want a pediatrician who has a schedule in synch with yours. I found many that were only open a few hours a day, Monday through Friday. And only a handful (if that) who were open any Saturdays at all (which was important for us). Are you going to want to schedule appointments for weekends? After work? Then make sure your potential candidates can accommodate that. Confirm In Network. Ah, the joys of medical insurance. Before moving any further, I would now contact my insurance company to make sure my top candidates are “in network.” ‘Nuff said. Request Consultation. At this point I would call each office and request a consultation with the pediatrician. I felt a bit awkward doing this at first (after all, I’ve never contacted any other type of doctor for a consultation), but apparently it is pretty common. All candidates I called except for 1 had special hours for these consultations. That 1 was scratched off the list. – Confirm hours of operation and urgent visit policies. – How can the doctor be contacted after-hours? What is the response time? – What hospital affiliations does the doctor have? – Who covers in the event that you are unavailable, on vacation, etc? – Any other questions about their medical views on nutrition, antibiotics, disease, as well as probing to get a feel as to how they interact with the kids. Talk to Parents in the Office. How long have they been using this pediatrician? What do they like/dislike? How long do they have to wait to see the doctor each time they come in? etc. Hire. By this, I mean that you simply let your birthing hospital know who your pediatrician is, and let the pediatrician know that you’ve decided to go with them. Now that I’m a parent, the things I most appreciate about my pediatrician is that I never have to wait (once we arrive, we are seen right away), they are great at handling urgent issues (since they don’t overbook, I’m able to come in at any time and be seen almost immediately), I’m able to contact him via email, he knows me and my family personally (e.g. we’re not just a number), he is open one Saturday a month, and he has accommodated some of my requests despite disagreeing (e.g. a modified vaccination schedule). These are not all things I thought would matter to me before the baby had arrived. I continue to learn how important the mother/pediatrician relationship is, so do pick someone you trust, can talk to openly, and who will not downplay your concerns. Pick someone who you would be comfortable discussing poop patterns with. Someone who you would be comfortable sending pictures of dirty diapers to (yes, we have done this). And someone who will care for your child’s health almost as much as you do. Ah, the granddaddy of controversial topics. Until I began researching this, I had NO IDEA how heated discussions become when the V-word is raised. I respect all opinions on the subject, and have come to the conclusion that whatever the parent feels is right for their child, is the right path for that parent to take. Let me also say that after some initial troubling reactions with my baby, I have done WAY TOO MUCH research on this topic. Besides my obvious personal interest, the subject intrigues me from a sociological standpoint. There is a lot of information out there in the form of peer-reviewed medical studies, case studies, and others – and I will admit I sometimes find myself down the rabbit hole with it all. The only way I can keep it all straight is to write down all my notes and references. So the real bottom line of this entire controversy is this: do the benefits of infant/child vaccines outweigh the potential risks? Proponents focus on the benefits of vaccinations, citing the elimination of various epidemics (e.g. smallpox), improved hospitalization rates for illnesses such as Rotavirus, and improvements in overall community health. Opponents focus instead on the potential risk of vaccinations, drawing correlations between vaccinations and certain neurological disorders, and citing cases of severe vaccine reactions. Both sides are justifiably passionate, as the focus here is on what’s best for our children. Run a quick Google search and you will find horror stories on both sides. The families who decided not to vaccinate, and then suffered heartbreak when their children contracted serious vaccine-preventable diseases. Or, conversely, the families who vaccinated as recommended, and then suffered heartbreak when their children suffered serious reactions. As a new, hormone-riddled, emotional mom reading these stories – it’s terrifying. So I decided to stop with the Google searches. I still wanted information. But unbiased, factual information. No more horror stories. I looked at several books. They all seemed pretty slanted one way or the other. I wanted to be able to read the facts and make my OWN decisions. And then I stumbled upon Dr. Robert Sears’ book. I can’t recommend this book enough if you’re looking for just the facts; the details of each vaccine, the diseases it helps prevent, the ingredients, potential side effects and risks of those effects, why some parents shy away from it and, ultimately, Dr. Sears’ personal thoughts – as a parent, board-certified Pediatrician, and proponent of “healthy and natural” living. The book is called The Vaccine Book: Making the Right Decision for Your Child. Complete the American Academy of Pediatrics (AAP) recommended schedule. This is the option that most pediatricians will not only support, but very strongly encourage. In fact, I’ve heard stories of some pediatricians effectively “firing” parents for opting to deviate from this schedule. Choose not to vaccinate at all. Although there are doctors out there who will support this approach, they seem to be few and far between. Follow a modified and/or delayed vaccination schedule. This option requires some work on the parent’s behalf to put together a desired schedule, and then find a pediatrician willing to execute it. For my family, I chose to go with a modified vaccination schedule. My primary reasons for doing this were to (A) minimize the number of aluminum-containing or live-virus vaccines my child receives at once, and (B) allow us a better opportunity to pinpoint exactly which vaccine caused a reaction should a reaction occur. After reviewing the ingredients included within each vaccine, aluminum was the one most concerning to me; hence our decision to limit our child’s exposure each time. Birth: Hepatitis B. Comes with 250mcg aluminum. (Had I done some research prior to this point, I would have held off on this until my son was much older – there is nobody close to us with this disease and as of yet, my son is not engaging in risky sexual activity or intravenous drug use). Month 2: Pentacel Combo (Sanofi Pasteur); Combination vaccine including HIB, DTaP, and Polio. A total vaccination count of 5 (DTaP is for 3 different diseases). One shot. Comes with 330mcg of aluminum; brand for these types of combo vaccines DOES matter in terms of aluminum content. Although planned for 8 weeks, we ended up delaying this until 11 weeks, which has pushed all subsequent vaccinations out 3 weeks as well. Month 3: Pc (Prevnar 13 brand – Wyeth) and Rotavirus (Oral vaccine – any brand). A total vaccination count of 2. 1 shot and 1 oral. Comes with 125mcg of aluminum. So as you can see, we basically are just splitting out the Month 2, 4, and 6 vaccines on the standard schedule (and refusing Flu altogether). We just completed Month 3 on our modified schedule; however not without some concerns. At the very least, I am glad that we are taking a slightly more conservative approach and not overloading his little body with up to 7 vaccinations at once, as well as being educated about and requesting specific brands that have fewer or lower levels of the ingredients I am most concerned about. Be forewarned, however, that if you choose to go with a modified schedule as we did, you may be in for a potential clash with your pediatrician. When I first broached the topic of modified schedules with my pediatrician, he made it very clear that he was adamantly opposed to them as he felt they serve no benefit whatsoever. He also strongly denied that any of the reactions I pointed out were related to the vaccines. I was surprised by his visible bristling to the topic being broached. So I kept at it with my pediatrician and ultimately, after a few tense conversations and awkward emails, he is accommodating. Begrudgingly accommodating, and with more than a few negative comments each time we go in for a new vaccination, but accommodating nonetheless. So be prepared. And those that opt out of vaccinations altogether – I’m not even sure where you would begin, although I have heard that there are some holistic doctors out there who will work with those families. At the end of the day, I truly believe there is no right or wrong answer, and encourage each family to research for themselves what is best for them. We’re all working towards the same goal of keeping our children as healthy as possible.